Join the Flagler County Chamber and the Flagler Beach Area Council for the 5th Annual Beach Bash on the Pier (formerly known as Peers on the Pier)! 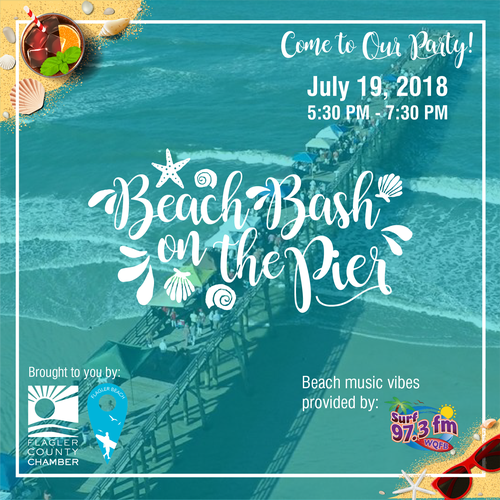 This awesome summertime event will offer food, fun, door prize drawings, an amazing view, beach vibe music provided by Surf 97.3FM and great company on the historic Flagler Beach pier. Guests will be given passports to visit all vendors on the pier and are encouraged to learn more about the local businesses that set up shop to showcase the services they offer. Guests turn in their completed passports for prize drawings that will occur. If your business is interested in participating, click here for the Vendor Application. Please note preference will be given to Flagler Beach based businesses first. This offer will expire on June 29 and then if space is still available, will open up to businesses outside of Flagler Beach. This great community event includes door prize raffles, 50/50 at 6:45PM. $10 Admission gets you two drink tickets and appetizers while supplies last.